I haven't talked much about my three miscarriages. In fact, back when I had my first one in 2002, I felt it was a source of shame and embarrassment. I thought it meant I was defective or something. I didn't really know anyone besides my sister and sister-in-law who had ever had one, and I had no place to turn to talk. That is all changing now. In fact, this week, October 15 is Pregnancy and Infant Loss Awareness Day. There are now websites and blogs that talk about this very subject, and give grieving mothers strength and hope, and most importantly, a place to turn. What was still missing, though, was a comprehensive guide for the grieving mother. 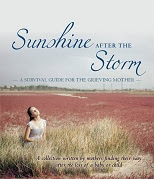 Alexa of the blog No Holding Back, who lost one of her twin daughters to Twin to Twin Transfusion Syndrome, recognized this need; and the collaborative book Sunshine After the Storm: A Survival Guide for the Grieving Mother was born. "That’s the thing about experiences – they turn into memories that you can keep forever and share over and over. Although our new baby, Baby E, will never have known Joey – experienced one of his super-tight big brother hugs, seen his ability to make any situation fun, been swayed by his happy motivational attitude, or delighted by his amazing creativity – he will get to share in those memories. He is two years old now, and he has heard the same stories that the three older boys have heard. He can pick Joey out in a family picture, and he listens intently when we all talk about him." This book has 28 amazing authors, all mothers who have lost a child. This book is their gift to you; and from October 13th through October 17th, it is free to download on Kindle or through your Kindle App. After that, the price will go back up to $3.99. The print version will likely be released later this month for those of you without a Kindle. You can follow the link above to get your copy, or click on the Amazon icon at the top of this page. Please also follow the Sunshine After the Storm blog and Facebook page to find out when other versions of the book will be released. And most importantly, please spread the word to anyone you think may need this book - someone who is grieving in silence and needs to know she is not alone. Grieving the loss of a child can leave a person feeling so incredibly alone, but it doesn't have to be that way.